Search for the best flight prices from Stansted to Marrakech. Compare prices, book today and save money with Stansted Airport. Beneath the embracing rays of the Moroccan sun, Marrakech has forever been the perfect city break for those looking to explore the very best of Morocco. World famous in this city of traders are the labyrinth-like markets stretching for miles in every direction and offering everything from beautifully handmade rugs and mounds of brightly-coloured spices to some of the most delicious street food you’ve ever tasted. To help keep your energy up while exploring the amazing architecture and welcoming Moroccan culture there’s plenty of exciting restaurants, cafes and even cocktail bars in which you can relax. The hotel scene in Marrakech caters for all budgets and requirements. Try the Riad El Fenn (2 Derb Moullay Abdullah Ben Hezzian) in the medina for understated glamour that entwines modern flavours with more traditional elements. The Angsana Riads Collection is more affordable, with six riads offering their own personality spread throughout the medina, including the lavish Riad Si Said and the Thai-themed Riad Bab Firdaus. Riad Itrane (113 Derb Jamaâ Derb Dabachi) is a centrally located choice for the lower budget, although there is a pool to relax in following a hectic day shopping the souks. Boutique hacienda JnaneTamsna (Douar Abiad) lies beyond the city walls, offering a luxurious bohemian setting away from the city’s hustle and bustle. Prepare for an overload of the senses as you dive into the souks of the medina, which ought to be the first port of call on any shopping trip in Marrakech. The winding streets are punctuated by fragrant mounds of colourful spices that coerce the nose towards the many spice markets (Rahba Kedima). Head to craft co-operative Complexe d’Artisanat (7 Derb Baissi, Rue de la Kasbah) for interesting fabrics, furniture and ceramics, while at Dar El Bacha you'll find shops selling everything from passementerie to jewellery and organic argan oil. Select your style among the leather bags and accessories at Lalla (Souk Cherifia, Sidi Abdelaziz), or head outside the medina and check out the sophisticated boutiques of the more modern Gueliz district. For high-end contemporary clothes and hand-embroidered shoes, seek out Michèle Baconnier (12 rue des Vieux Marrakchis). Marrakech boasts a wide array of options for the discerning foodie, offering everything from fine dining to street food. Head to Jemaa el Fna square in the evening and browse the selection of tagines, grilled meats and pastilles from over 100 stalls that throw up a vibrant atmosphere. Alternatively, try the cultivated Terrace des Épices (15 Souk Cherifia, Sidi Abdelaziz) and sip rooftop cocktails whilst enjoying sunset vistas of the square - a popular delight among local expats. Le Salama (40 rue des Banques) is a lively dining spot offering entertainment such as belly dancing to accompany an evening meal, while Gastro MK (14 Derb Sebaai, Bab Laksour) is an ideal haunt for special occasions thanks to its excellent fine dining reputation. Cheer on the 6,000-plus determined runners who brave Marrakech’s marathon each year. The route takes in the outer edges of the medina along with the attractive orange groves of the Menara gardens. This celebration of traditional Moroccan music translates to a vibrant festival which has been passed down through generations. Drumming and chanting combine to provide a foot-stomping backdrop to the lively music. El Badi Palace and Jemaa el Fna square are the epicentre of this festival which features a variety of entertainment from dancers and artists to theatre groups and snake charmers, and ramps up Marrakech’s frenetic pace even further. 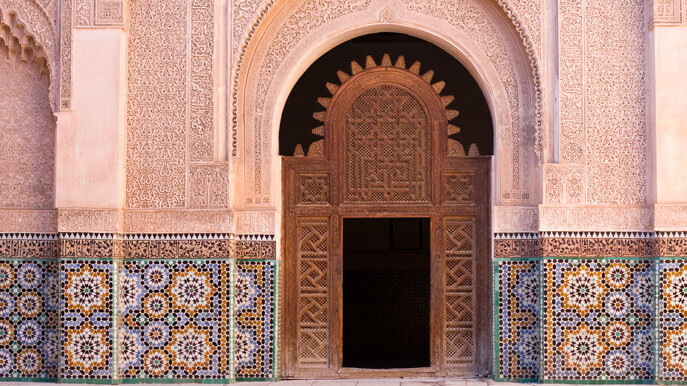 Marrakech puts a Moroccan twist on this incarnation of the well-known Swiss festival, laying on traditional Moroccan music in delightful settings such as Bahia Palace and the Menara gardens. Marrakech’s film festival thrusts the best of Moroccan cinema into the spotlight, attracting an international crowd in the process as the country showcases its burgeoning film industry.